No one in my immediate family (or my husband’s) has a food allergy so we were very surprised to learn that our son is allergic to peanuts and tree nuts. It is something completely new to us but something we needed to learn about very quickly. Having a child with a food allergy is very scary it can make otherwise normal outings like dinner at a restaurant or attending a birthday party a very stressful experience. There are many ways that parents can make sure all of the kids at a party are safe and can all enjoy the delicious food. 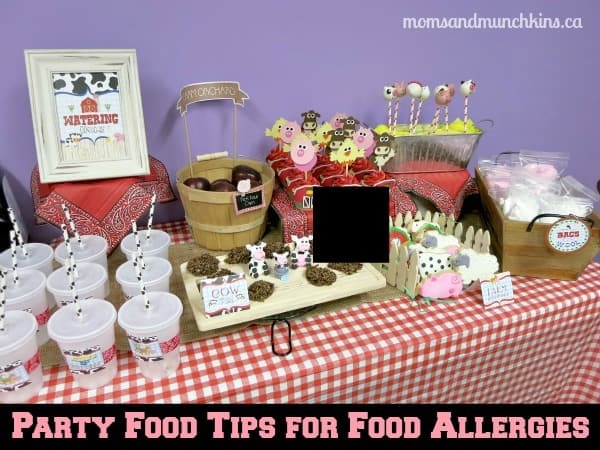 Here are a few party food tips for food allergies that you can use at your next party. 1) When asking for a RSVP for a party, also ask parents to let you know about any food allergies. This will help you plan out your party menu. Some parents will say that they’ll pack snacks for their own child to enjoy at the party. With my little guy, I always bring a homemade muffin for him to eat while the other kids enjoy the cake. He’s two years old so he doesn’t care yet that he doesn’t get any of the delicious icing or cake. 2) Kids don’t want to be left out of any part of the party – especially if that part is the delicious cake! It’s tough for a child to understand why they aren’t allowed to eat a piece of cake when all of the other kids at the party get to. If there is a child at the party that has a food allergy, try to accommodate this by ordering a dessert that doesn’t contain the food that causes the allergy (example, peanut-free cake). If that isn’t possible, be sure to offer a special alternative dessert for the child that has the food allergy (example, a bowl of fruit cut into fun shapes). 3) If you aren’t able to order food that doesn’t contain the ingredient that the child is allergic to, be sure to let the other guests know about the food allergy. For example, if you are serving a cake that may contain traces of peanuts at a party where a child has a nut allergy be sure that the guests know not to leave their cake plates laying around. It’s so tempting for a child (especially toddlers) to sneak a bite of cake when they see an unattended plate of leftovers. 4) Know the ingredients in your food. Some guests may not tell you about the allergy ahead of time but when they arrive at the party they need to know what’s in each of the foods before digging in. Be sure you have that information on hand to provide to them. Guessing or assuming is not good enough. You may be surprised at the ingredients in food so always be sure to read the ingredient labels carefully. When you plan a birthday party for your child, do you ask the guests to RSVP with any allergy information or do you assume the parents will deal with it themselves at the party? Let us know in the comments below. If you have party food tips for food allergies, we want to hear about them! For more birthday party ideas (themes, decorations, games and more), visit our Birthday Party page. We’re always adding new ideas so be sure to follow along on Facebook, Twitter, Pinterest and Bloglovin’ for the latest updates. I’ve never ever had to deal with anyone’s food allergies before, but now that my kids are getting bigger and meeting more people, I’m so paranoid about it. Great tips! thank you for the tips, thankfully my kids do not really have food allergies but many of my friends kids do. Great tips! What a neat idea! My daughter suffer from some food allergies so this is a great option for other kids as well. You parties always look so fun! Some great tips for parents. These are so great tips. So many kids have allergies today and as a host, you should always make sure all allergies are acknowledged and that the food is edible for all attendees.